James Calvin Davis teaches ethics and Christian Studies at Middlebury College (VT). 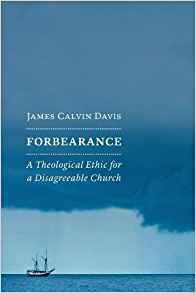 His latest book, Forbearance: A Theological Ethic for a Disagreeable Church (Eerdmans, 2017), offers guidance for how Christians can see disagreement in the church not as a problem, but as an opportunity to practice virtue, and in doing so model for the world a better way for navigating difference. An expert on the role of religion in American democratic life—past and present—Davis writes widely about the ways Christianity in particular has contributed (positively and negatively) to American debates over economic equality, human rights, health care, education, justified violence, and religious freedom. In his writing, lecturing, and teaching, he insists that historical and theological perspectives offer needed wisdom for healthier public discourse in the U.S. today. A graduate of the University of Virginia, an ordained minister in the Presbyterian Church (USA), and a life-long Steelers fan, Davis lives in rural Shoreham, Vermont, with his wife Elizabeth and their two sons.